Welcome to Online Reasoning Test in AffairsCloud.com. We are starting Cumulus Course for IBPS PO 2018 Main Exam and we are creating sample questions in Reasoning section, this type of Question will be asked in IBPS PO 2018!!! An input-output is given in different steps. Some mathematical operations are done in each step. No mathematical operation is repeated in next step. What is the multiplication of all the numbers of step 2? Which is the largest number obtained in step 1? 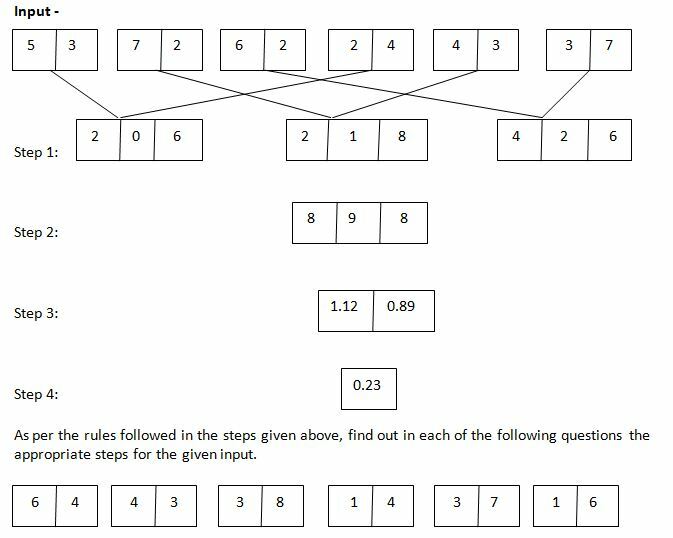 If the third number of all the boxes is halved and then added the half numbers, what is the result in step 1? What is the sum of numbers in step 3? Which is the following number obtained in last step? (Directions 6 – 10): Study the information given and answer below question. Six persons P, Q, R, S, T and U are sitting in a row facing in the north direction. Who sits between R and T? (I) P sits second from the left end. 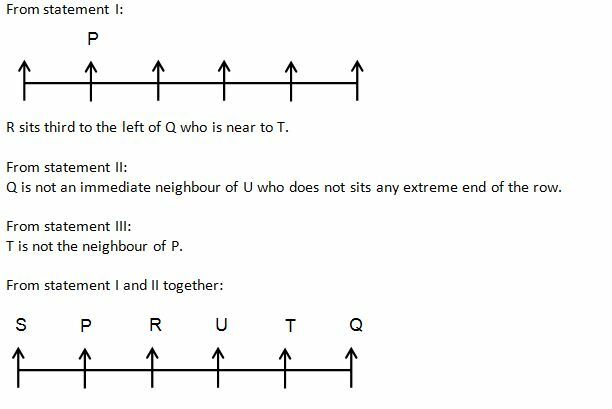 R sits third to the left of Q who is near to T.
(II) Q is not an immediate neighbour of U who does not sits any extreme end of the row. (III) T is not the neighbour of P.
If the data in statement I alone or in the statement II alone or in the statement III alone is sufficient to answer the question. If the data in statement I and II are sufficient to answer the question, while the data in statement III are not sufficient to answer the question. If the data in statement I and III are sufficient to answer the question, while the data in statement II is not sufficient to answer the question. If the data in statement II and III are sufficient to answer the question, while the data in statement I is not sufficient to answer the question. If the data in all the statement I, II and III are necessary to answer the question. Answer – 2) If the data in statement I and II are sufficient to answer the question, while the data in statement III are not sufficient to answer the question. There are 5 boys W, X, Y, Z, and A who are standing according to their height. What is the position of boy Y? (I) Boy Z is the tallest. Boy X is just behind W but not on even numbered position. (II) Boy Z does not stand on an even number position. 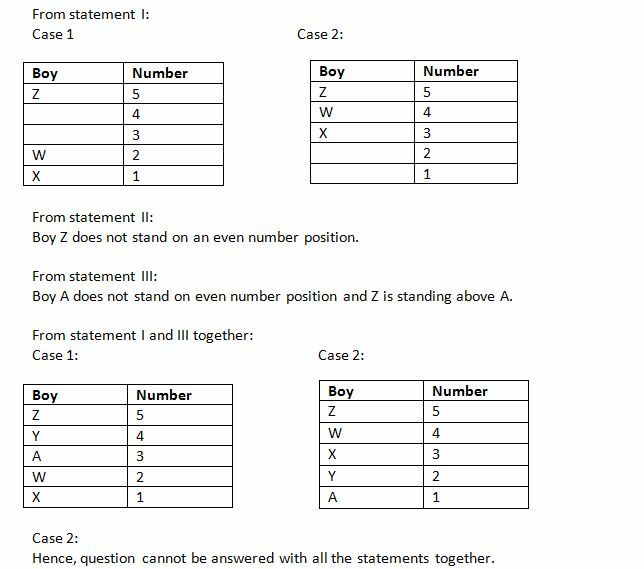 (III) Boy A does not stand on even number position and Z is standing above A. If the data in statement I and II together are sufficient to answer the question, while the data in statement III are not sufficient to answer the question. If the data in statement I and III together are sufficient to answer the question, while the data in statement II is not sufficient to answer the question. 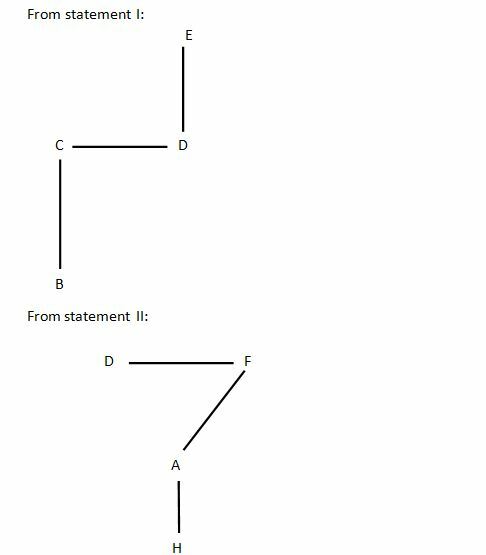 If the data in statement II and III together are sufficient to answer the question, while the data in statement I is not sufficient to answer the question. If the data in all the statement I, II and III together are necessary to answer the question. Answer – 5) If the data in all the statement I, II and III together are not sufficient to answer the question. Who among P, Q, R, S and T each one having different weight is the third heaviest? I. Q is heavier than R and S. T is heavier only than P.
II. Only three are lighter than R. The weight of Q is 40kg which is 4kg more than R. S is heavier only than P and T.
If the data even in both statements I and II together are not sufficient to answer the question. Answer – 2) If the data in statement II alone are sufficient to answer the question, while the data in statement I alone are not sufficient to answer the question. Hence, statement II alone is sufficient to answer the question. Four storey building (contains ground floor and four floors on top) is numbered as ground floor as number 1 and so on. Five different persons – H, I, J, K and L live in five storey building. Who lives on the lowermost floor (i.e. floor number 1)? I. J lives on floor number 3. K lives immediately below L. K lives on an even numbered floor. II. Only two people live between L and H. L lives above H. J lives immediately below K. J lives on an odd number floor. ‘A’ is in which direction with respect to ‘B’? (I) C is north of B and west of D who is south of E.
(II) D is west of F who is north east of A who is north of H.
(III) A is north of G and south west of C.
If the data in all the statement I, II and III together are not sufficient to answer the question.